^ UAE Constitution. Helplinelaw.com. [2008-07-21]. 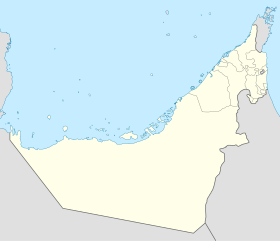 ^ United Arab Emirates: metropolitan areas. World-gazetteer.com. [2009-07-31]. （原始内容存档于2009-08-25）. ^ The 2008 Global Cities Index. Foreign Policy. 2008-10-15 [2010-04-20]. （原始内容存档于2010-05-20）. ^ Sampler & Eigner. Sand to Silicon. UAE: Motivate. 2008: 11. ISBN 9781860632549. ^ DiPaola, Anthony. Dubai gets 2% GDP from oil. Bloomberg. 2010-09-28. ^ 9.0 9.1 Oil share dips in Dubai GDP 互联网档案馆的存檔，存档日期2013-09-26. AMEInfo（英语：AMEInfo） (9 June 2007) Retrieved on 15 October 2007. ^ Dubai economy set to treble by 2015 ArabianBusiness.com (3 February 2007) Retrieved on 15 October 2007. ^ 11.0 11.1 Dubai diversifies out of oil. AMEInfo（英语：AMEInfo）. 2005-09-07 [2008-08-12]. （原始内容存档于2008-12-19）. ^ Cornock, Oliver. Dubai must tap booming halal travel industry - Khaleej Times. www.khaleejtimes.com. [2016-12-16]. ^ Davis, Mike. Fear and money in Dubai. 新左派評論 (New Left Review). September–October 2006, II (41): 47–68. ^ Job losses hasten property decline in Dubai but medium-long term outlook upbeat. Propertywire.com. 2008-12-03 [2009-07-14]. ^ Mohammad Bin Rashid approves Dubai's budget for 2015. gulfnews.com. [2015-05-25]. ^ Historic population statistics (PDF). [2009-07-31]. （原始内容 (PDF)存档于2009-03-26）. ^ Central Bank of the United Arab Emirates. [2016-12-11]. ^ 迪拜历史文化,传说 - 艺龙旅游指南. trip.elong.com. ^ Climate in Dubai across the year. Dubai Meteorological office. Dubaiairport.com. [2013-04-20]. （原始内容存档于2010-12-18）. ^ Temperature and Humidity in Dubai. Godubai.com. [2013-04-20]. （原始内容存档于2012-03-19）. ^ Climate. Dubai Meteorological Office. [2008-12-20]. （原始内容存档于2010-12-18）. ^ Records and Averages of Dubai, United Arab Emirates. Qwikcast. （原始内容存档于2011-07-18）. ^ Ask Ali: Kissing in public, renting a flat and the rababah – The National. （原始内容存档于2016-08-29）. ^ Jailed Dubai kissing pair lose appeal over conviction. ^ London man tells of 'shock' jailing in Dubai over kiss. 2010-07-05. ^ Za'za, Bassam. Women get jail and deportation for kissing on Dubai public beach. gulfnews. 2008-05-25. ^ Etihad Airways. A Surprise Proposal on Etihad Airways. 2014-03-20 –通过YouTube. ^ Reporter, Bassam Za'za', Senior. Law gets tough on drunk drivers in Dubai. GulfNews. 2010-05-16 [2017-02-02]. ^ Everington, John. Dubai enters top five ranked fastest growing economies. The National. 2015-01-22 [2015-03-24]. ^ Dubai's gross domestic product is expected to reach US$107.1 billion, posting a growth rate of 6.1% in 2014 and exceeding Dubai government's estimates of 5%, according to Citibank.. Zawya Thomson Reuters. 2014-06-14 [2015-03-24]. ^ Dubai – Overview. USA Today. [2007-07-22]. ^ Dubai's oil discovery and Dubai's debt. Moneycontrol.com. 2010-02-05 [2013-04-20]. ^ UAE Oil and Gas. Uae.gov.ae. 1999-06-19 [2009-07-31]. （原始内容存档于2008-07-05）. ^ Your Guide to Dubai. Dubai - 工作秘方. 2013-10-16 [2013-10-16]. ^ 焦點新聞 - Google 新聞. news.google.com.tw. ^ Gulfnews: Dubai traffic woes inflict losses of Dh4.6b a year. Archive.gulfnews.com. [2009-07-14]. （原始内容存档于2009-08-25）. ^ Gulfnews: Public transport regains allure as Car-free Day gets under way. Archive.gulfnews.com. 2010-02-17 [2010-04-29]. ^ Gulfnews: Rta wants 30 of dubai residents on public transport. Archive.gulfnews.com. 2010-01-21 [2010-04-29]. ^ 2008 Annual Report. Dubai Airport. 2009 [2009-02-28]. （原始内容存档于2010-01-11）. ^ DXB Takes Over Top Spot for International Passenger Traffic. dubaiairports.ae. （原始内容存档于2015-04-29）. ^ Dubai RTA – Dubai Metro – Blue Line. zawya. 2009-09-11. （原始内容存档于2011-06-17）. ^ Will metro change Dubai car culture?. BBC News. 11 September 2009. ^ Human Rights Watch – Building Towers, Cheating Workers: Exploitation of Migrant Construction Workers in the United Arab Emirates. [2014-10-04]. ^ Human Rights Watch. Building Towers, Cheating Workers: Exploitation of Migrant Construction Workers in the United Arab Emirates (PDF) PDF. [2016-02-12]. ^ UAE to allow construction unions. BBC News. 2006-03-30. ^ Dubai fire investigation launched. BBC News. 2007-01-19. ^ 57.0 57.1 Karin, Luiza. Modernity and tradition in Dubai architecture by Luiza Karim. alshindagah.com. September 1999 [2010-04-19]. ^ Hadjari, Karim. 3D Modelling and Visualisation OF Al Baskita in Dubai IN Dubai, United Arab Emerites (PDF). [2010-04-19]. （原始内容 (PDF)存档于1996-01-01）. ^ Tourism in Dubai (PDF). [2010-04-19]. （原始内容 (PDF)存档于1996-01-01）. ^ Lahmeyer, Jan. The United Arab Emigrates – Historical demographical data of the urban centers. .populstat. 2001 [2010-04-19]. ^ Heard-Bey, Frauke. The Tribal Society of the UAE and its Traditional Economy (PDF). uaeinteract.com. [2010-04-19]. （原始内容 (PDF)存档于2011-04-28）. ^ Census 2005 U.A.E.. tedad.ae. [2010-04-19]. （原始内容存档于2010-05-16）. ^ 63.0 63.1 Younes, Bassem. Roundabouts vs. Intersections: The Tale of Three UAE Cities (PDF). ite.org. [2010-04-19]. （原始内容 (PDF)存档于2009-03-26）. ^ Dubai in Figures 2009. Government of Dubai. Statistical Center. Dsc.gov.ae. [2010-10-31]. （原始内容存档于2010-04-20）. 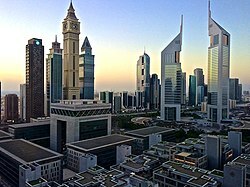 ^ Dubai population jumps 4.8 per cent to 2.17m. UAE interact. [4 September 2014]. （原始内容存档于19 August 2014）. ^ Call to naturalise some expats stirs anxiety in the UAE. Reuters UK. ^ GCC Citizenship Debate: A Place To Call Home. Gulf Business. ^ Christensen, Shane. Frommer's Dubai. John Wiley & Sons. 2010: 174. ISBN 978-0-470-71178-1. ^ Nama Tuluveru all set to entertain UAE with Rangabhoomi's 'Kaala Chakra'. daijiworld.com. [2016-02-12]. ^ Languages spoken in Dubai. Justlanded.com. [2013-04-20]. ^ Sales will account for 8% of Dubai's GDP. Gulfnews.com. 2009-05-03 [2013-04-20]. （原始内容存档于2013-05-08）. ^ Dubai is sister city to Barcelona, on the municipality's website (in Catalan), retrieved on 28 October 2015. ^ Dubai and Busan are sister cities, on the municipality's website Archive.is的存檔，存档日期2016-03-18, 13 November 2006. ^ Sister Cities Agreement between Detroit and Dubai, 28 September 2003. ^ Partnerships: Frankfurt am Main. Council of European Municipalities and Regions. [2015-02-16] （德语）. ^ Dubai and Gold Coast are sister cities, on the municipality's website. Retrieved on 28 October 2015. ^ Dubai is sister city to Shanghai, on the municipality's site , 27 July 2009. ^ Dubai and Istanbul are sister cities, on the municipality's website (in Turkish), 22 March 1997. ^ Wako: Kerjasama Padang-Perth-Dubai Saling Menguntungkan. ANTARA（英语：Antara (news agency)）. 2015-09-15 [2015-12-27] （印度尼西亚语）. ^ KL's Sister Cities - Poskod Malaysia. 2010-10-21 [2013-05-20]. （原始内容存档于2013-08-30）.